Well, not much blood, really, but she would like to stick you repeatedly with needles. Perhaps I should explain. Shirleen is taking at phlebotomy course (as I’ve outlined previously she already knows how to do pretty much everything else in the World). My faux nephew, Tyler, is taking the course, too (bless his needle-phobic lil’ heart). She needs volunteers to be poked (need I add WITH NEEDLES) tonight (Tuesday, August 28, 2007) and on Thursday at 6:00 p.m.
Shirleen practiced on me the other night, and, as someone who’s had their blood taken for various tests at least once a month or so all this year and someone who used to participate in a specialty plasma donation program (those needles have the girth of earthworms), I can tell you she did an excellent job. I can’t vouch for anyone else, mind you, and I don’t know whether or not she has to share her volunteers. That adds an air of titillating risk to it, yes? 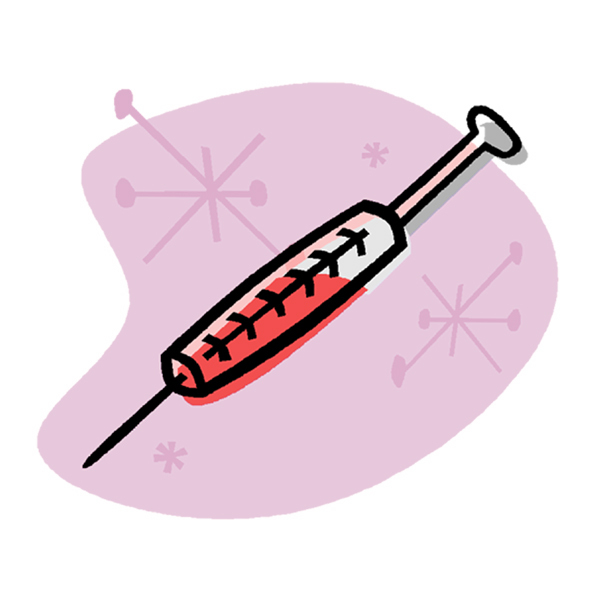 So let me know if you’d like to spend your Tuesday and or Thursday evening this week letting neophyte phlebotomists stick you with small-gauge needles for the sake of learning – nay – for the very future of medicine and healthcare. Tempting. But I think I am busy pushing back the cuticles on my toe nails tonight. So sorry I’ll miss it. You are SO IN LUCK! Push your cuticles back tonight and come TOMORROW NIGHT for novice needle sticking! How lucky, indeed.